On 7 November 2016, the Ministry of Internal Affairs and Communications, Ministry of Foreign Affairs, Ministry of Education, Culture, Sports, Science and Technology, and CLAIR hosted the JET Programme 30th Anniversary Commemorative Ceremony at the Keio Plaza Hotel (Shinjuku) in the presence of their Imperial Highnesses, the Crown Prince and Princess of Japan. The JET Programme began in 1987 with 848 participants from 4 countries. Started with the goals of enriching foreign language education, promoting mutual understanding between Japan and foreign countries, and furthering the internationalisation of Japan’s local regions, the JET Programme has grown to one of the largest exchange programmes in the world, with 4,952 people from 40 countries participating in 2016; in total, approximately 65,000 people from 65 countries have participated over the Programme’s 30 year history. At the 30th Anniversary Commemorative Ceremony, 720 local government officials, current JET Programme participants, and JET Programme alumni who are active both in and outside of Japan gathered and reflected on the Programme’s accomplishments over its 30 years. 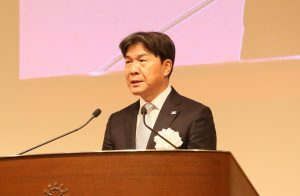 Chair of the Board of Directors at CLAIR, Tamotsu Okamoto, opened the ceremony with an address calling for the Programme’s further development, stating ‘JET Programme participants have formed strong ties with people in regions all over Japan, and performed a vital role in supporting the country. After their time on the Programme comes to an end, many continue to work as bridges between Japan and the rest of the world, putting their experiences to use in various fields in their own countries, from government agencies to Japanese companies… This milestone marks the beginning of a new chapter and we strive to contribute to a better future for Japan and the rest of the world’. Following Okamoto’s address, Sanae Takaichi, Minister of Internal Affairs and Communications, Fumio Kishida, Minister of Foreign Affairs, and Hirokazu Matsuno, Minister of Education, Culture, Sports, Science and Technology, also made some opening remarks on behalf of the hosting ministries. To complete the first part of the ceremony, his Imperial Highness the Crown Prince of Japan gave a speech. This was followed by the presentation of the ‘JET Declaration’, presented by Ryan Hata (Current JET Participant Representative) and Kwon Joohyun (JET Alumni Representative). The Declaration represented a message from the key players in the Programme’s success, the current and former JET Programme participants. Next, commemorative addresses were made by H.E. Ricardo Allicock, Ambassador from Jamaica to Japan, and H.E. Ian Burney, Ambassador from Canada to Japan. 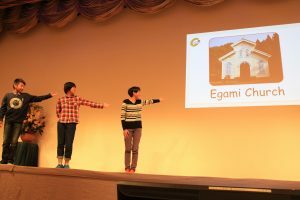 To report on the accomplishments of the JET Programme, representatives of Sendai City in Fukushima and Goto City in Nagasaki, as well as Sojitzu Corporation, who have employed a number of former JET participants, made presentations in the 2nd part of the ceremony. During the 3rd part of the ceremony, the JET Programme Video Contest Award Ceremony was held. CLAIR created the contest as a platform for JET Programme participants and alumni to utilise their unique insight to discover and share the hidden charms of Japan’s local regions; a total of 107 videos were submitted to the contest. At the ceremony, 10 award winners, including First Prize Winner Alex Barnett, were presented with awards. At the Commemorative Reception following the ceremony, ‘Five Drums Sairyu’ from Minimata City, Kumamoto, and Ukulele group ‘Ukestra’ from Nagasaki City, two groups featuring current and former JET Programme participants, enlivened the attendees with their performances. In addition, popular mascot character ‘Kumamon’ from Kumamoto Prefecture also came to support Five Drums Sairyu with their performance and entertain the guests. Video footage and reports of both the ceremony and the reception are available for viewing by clicking the items on the list below.